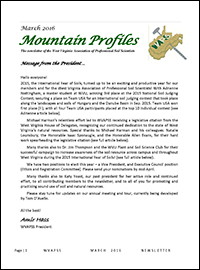 Mountain Profiles is the newsletter of the West Virginia Association of Professional Soil Scientists. It is published on an irregular basis--usually whenever the President gets around to it. 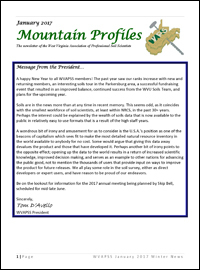 The most recent issue of Mountain Profiles was published in January 2017. Archives of Mountain Profiles (1994-2016) are are also available here.